The authors of this commentary are part of the leadership team of Youth MOVE National (YMN), a youth-run, chapter-membership organization focused on improving services and systems for youth and young adults by uniting the voices of individuals who have lived experience within those systems. Their perspective on priorities for future research reflects their appreciation of formal research literature, and is complemented by what they have learned through their work with YMN's extensive chapter network, through partnering with service systems and agencies around the nation, and through connecting with young people around the country. Reflecting a growing evidence base, programs and initiatives aimed at improving outcomes for youth and young adults with serious mental health conditions increasingly recognize the importance of taking a positive youth development (PYD) approach. A positive youth development perspective has important implications for systems of care that serve young people with serious behavioral health and related needs. These implications range from transforming and expanding the existing array of services and supports so that they are more supportive of PYD, to increasing the extent to which young people have influence in the design and implementation of services and service systems. Organizations run by and for young people with lived experience in behavioral health and related systems play a unique and important role in promoting and supporting systems change that is in line with this PYD vision. Research is needed to support evolution of systems and services so that they are more in line with PYD, and to better understand and document the important role of youth-run organizations in this transformation. In recent decades, more and more youth-serving organizations have begun to operate from a PYD focus. PYD is an intentional, pro-social approach that engages youth and young adults within their communities, schools, organizations, peer groups, and families in a manner that is productive and constructive; that recognizes, utilizes, and enhances young people's strengths; and that promotes positive outcomes for young people by providing opportunities, fostering positive relationships, and furnishing the support needed to build on their leadership strengths. Organizations explicitly shifting to a PYD focus include Boys & Girls Clubs, 4-H, and the YMCA, among many others. These organizations continue to serve as cornerstones in communities across the country, and each offers an opportunity for a safe, supportive environment and developmentally appropriate programming for youth. However, traditional PYD programs such as these often lack the funding, capacity, and/or expertise to engage and serve youth and young adults with significant behavioral challenges and to address their unique developmental needs. Frequently, these programs also have policies or restrictions that exclude older young adults, and/or young people with significant behavioral health challenges. These programs may also be inaccessible to young people with limited economic resources. The gap in PYD programming for youth and young adults in communities around the country is starting to be filled by organizations that are run by and for youth and young adults who have experienced behavioral health challenges, and who are personally knowledgeable about the strengths and limitations of existing services and systems. There is true innovation occurring now within these organizations, as they focus on meeting the needs of youth in the community by providing them with access to PYD programming, as well as other services that are not part of the traditional mental health service array. What is more, youth-run organizations are uniquely positioned to support the transformation of youth-serving systems so that they are more consistent with PYD principles. Youth MOVE National (YMN) is an established youth-run organization devoted to improving services and systems for youth and young adults by uniting the voices of individuals who have lived experience within those systems. YMN's chapter network spans 38 states, 4 tribes, and the District of Columbia, building a cross-system, cross-cultural, and varied geographical representation of youth voice and experience. Youth MOVE membership includes youth and young adults ages 14-29 who have lived experiences inclusive of mental health, criminal justice, LGBTQI2-S, child welfare, substance misuse, homelessness, residential treatment, developmental and physical disabilities, supported employment experiences, as well as parenting teens, immigrants and refugees, young people with HIV/AIDS, tribal youth, and members of the military. In line with the YMN mission, "Motivating Others through Voices of Experience," chapters offer PYD programming that is responsive to the developmental needs of their diverse members, including youth leadership and advocacy training, positive and pro-social activities, skill development groups, research and evaluation, and navigation and referral services (Grimm, Bergan, & Kendrick, 2014). Within these activities, there are natural spaces that are developed and defined by "peerness" and that are qualitatively different from formal treatment in a system. The ability of youth-run organizations to provide a safe, supportive, and positive environment for youth and young adults with lived systems experience to come together is key to promoting the kinds of supportive peer relationships youth are continually seeking, and that are a key element of PYD. While youth engagement in traditional provider agencies is important, this work of youth-run and -operated space is unique and also important. YMN chapters and other similar organizations differ from formal, traditional services in other ways as well. For example, in contrast to formal mental health and related services that almost always have barriers that limit access (e.g., referral, diagnostic criteria, health insurance), programming offered by YMN chapters is community based and easily accessible, with little to no barriers to participation. Also in contrast to more formal services—which follow a timeline of enrollment, utilization, and completion—young people can access programming at YMN chapters at the frequency and intensity that they find helpful and comfortable. YMN chapters and other similar organizations also play a key role in motivating and supporting the transformation of service systems so that they are more in line with PYD principles. Over the past twenty years, behavioral health and parallel systems have placed a growing emphasis on empowering youth and young adults with lived experience to exercise their "voice" in all aspects of efforts to improve systems and services. Great strides occurred within the federally-funded Children's Mental Health Initiative grant program, more commonly referred to as Systems of Care (Stroul, Dodge, Goldman, Rider, & Friedman, 2015). Systems of Care grantees have established standard principles to assure that youth voice is a critical element of required programing, from service delivery to governance. The commitment to youth participation in system-improvement efforts has expanded greatly in youth homelessness work, the substance abuse field, and within juvenile justice and child welfare during this time as well. Meaningfully engaging youth and young adults in systems-change work is no easy feat. It takes commitment from organizational leadership and an investment in a culture change and resources. Youth-run organizations are natural partners in these efforts as key goals of their programming (i.e., building leadership and advocacy skills, providing opportunities to participate in research and evaluation, supporting community and civic engagement) are a perfect complement to systems' efforts to align with PYD principles. In order to align with PYD principles, systems need active strategies for empowering young people to shape and guide their own services, as well as to participate in larger systemic change. Youth-run programs help to meet this need by providing training and technical assistance to service provider agencies and system partners, so that they can prepare the space for authentic youth engagement. At the same time, these activities provide opportunities to youth and young adults to increase their skills and build experience as part of systems-change work. The youth-run organization can provide training to system partners and agency staff on youth engagement, can identify youth with lived experience to join advisory or governance boards, and can provide an invaluable peer network for these youth leaders. Furthermore, young people who have access to the leadership and advocacy training and support from youth-run organizations are prepared to be meaningful participants not only in their own care, but also in leadership and advisory roles within service agencies. There is evidence that agencies and systems that employ youth engagement strategies (e.g., youth on governance boards, youth advisory councils, youth participating in program evaluation and continuous quality improvement efforts) reap benefits from doing so. It has been documented that engaging youth and young adults in these roles can benefit systems and agencies by helping them to design and implement new policies and practices that lead to more engaging and effective services (Center for the Study of Social Policy, 2007; Ockenden & Stuart, 2014). There is also evidence that youth and young adults benefit when they become engaged in activism, advocacy, and other community and civic roles. Young people point to these roles and activities as a source of increased confidence and self-esteem, as well as an opportunity to learn new skills, including organizational skills, communication and group skills, and a variety of employment-related skills (Center for the Study of Social Policy, 2007; Ockenden & Stuart, 2014). As youth and young adults have grown more influential in systems-change efforts, they have consistently advocated for increased access to peer support. While research is limited in the area of youth peer support, results from emerging youth peer programs, and promising findings from research in adult peer support and youth mentoring programs, warrant a growing interest in the field in continued investment in youth peer support programs. There are important roles for youth-run organizations to play in the growth of the youth peer support. The most vital role is in the development of the workforce. In order to have a workforce of youth peer providers, more is needed than simply selecting and adopting a training program and certification model. First of all, there must be a pipeline for youth to learn about the peer role. Youth-run organizations attract and invest in the very youth who are a best fit for youth peer provider roles. In fact, these organizations are perfectly situated to identify and recruit future youth peer providers. Youth-run organizations can support peer roles and the peer workforce in other ways as well. For example, when young adults enter into peer roles, initial training is usually required. However, ongoing enhancements to that training are also needed. Many communities turn to their youth-run organizations to provide significant portions of this continued training. Additionally, a key strand of activity within the youth peer provider role is to assist young people with identifying and building natural supports and community connections. In fact, most programs struggle to provide young people who lack support and connections with positive peer environments and opportunities to develop leadership and advocacy skills. As discussed above, youth-run spaces and youth-driven organizational programming can make these opportunities accessible to young people who are involved in systems and/or who receive peer support. Finally, youth peer providers serve in a unique and demanding role. Frequently this role may feel isolating. Youth-run organizations can leverage their networks to build peer space for youth peer providers to develop relationships and access capacity-building training to support their long-term success in the role. While the youth movement is continuing to make great strides in building effective support networks for vulnerable youth populations and improving services, there is much work to be done. The work of youth-run organizations, including Youth MOVE chapters, needs to be driven by the powerful voices of youth with lived experience, and yet, there are essential roles for all partners in the system to play. It is likely that investments in services and systems that promote PYD will continue. Aside from Systems of Care, the Federal Interagency Working Group on Youth Programs also recognizes the importance of positive youth development programs and works to ensure that current research-based content is identified to support federal efforts in promoting PYD (Dyminicki et al., 2016). In order to move this goal forward, there must be adequate investment and commitment from policy makers and service providers to shift how services are accessed and delivered. This shift would require the adoption of youth-guided planning, advancement of youth peer support programs that are readily accessible, and an investment in the infrastructure and operation of youth-run organizations. Funding is needed to promote innovation and to kick start the translation of these ideas into programs. What program indicators lead to increased and sustainable youth engagement? To what extent do youth-run programs offer practices that lead to improved outcomes for youth involved? To what extent do youth-run organizations shape policy and practices within helping systems? What are the core competencies of an effective youth peer workforce? The work of most youth-run organizations is in exploration and early-development phases. For long-term sustainability, youth-run organizations will need to strengthen their organizational infrastructure, build the capacity of their teams, and identify a diverse set of sustainable funding sources. Key commitments need to be made by systems leaders at the federal, state, and tribal level, to leverage flexible funding streams to support youth-run organizations. Strong and lasting commitments, cemented in policy, need to be made to ensure the ongoing presence and influence of youth voice and youth-run organizations within systems and services. The choice to invest and finance youth-guided, community-based services is available to system leaders. Making a commitment now will provide the foundation for youth and young adults to continue the work of improving our social systems. Grimm, J., Bergan, J., & Kendrick, L. (2014). Youth-driven organizational purpose areas. Baltimore, MD: The Technical Assistance Network for Children's Behavioral Health. Masselli, B., & Bergan, J. (2018). 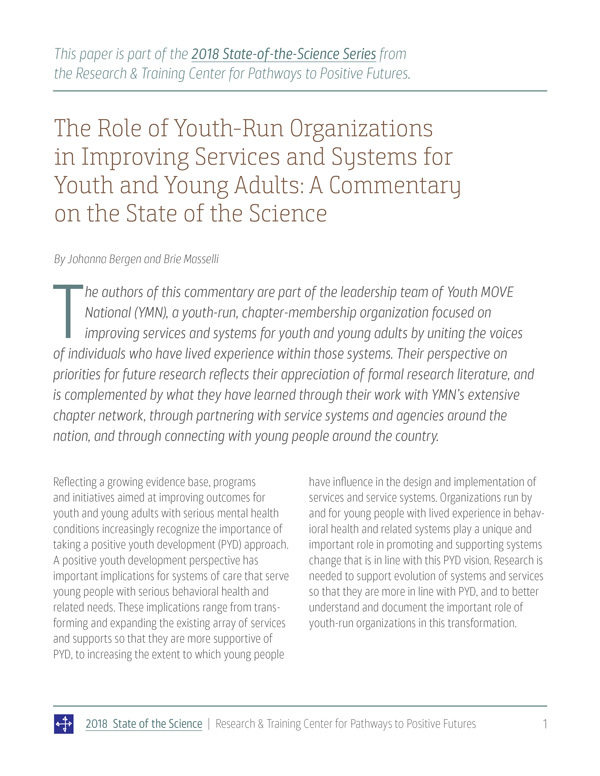 The Role of Youth-Run Organizations in Improving Services and Systems for Youth and Young Adults: A Commentary on the State of the Science. Portland, OR: Research and Training Center for Pathways to Positive Futures, Portland State University.